Milton Toyota is owned and operated by the Gorman family, who are actively involved in the day to day operations. With over 50 years automotive experience, the Gorman's and their team have built a reputation of taking care of the thousands of customers who have relied on them for all their automotive needs. In addition to the new and used vehicle showrooms, Milton Toyota has a full Service department that services all makes and models, a complete Parts and Accessories department and a full service retail Vehicle Cleaning and Detailing Centre. "We strive to be different in every way possible. For as long as I can remember our company has been committed to building lifelong relationships with our customers. It's never been about selling or servicing a vehicle just once. It's about building trust and developing relationships by providing top-quality product and a team of employees committed to delivering an outstanding sales and service experience. We're always looking beyond today to ensure we deliver the quality, value and the experience our customers want and deserve. - Chris Gorman, President. 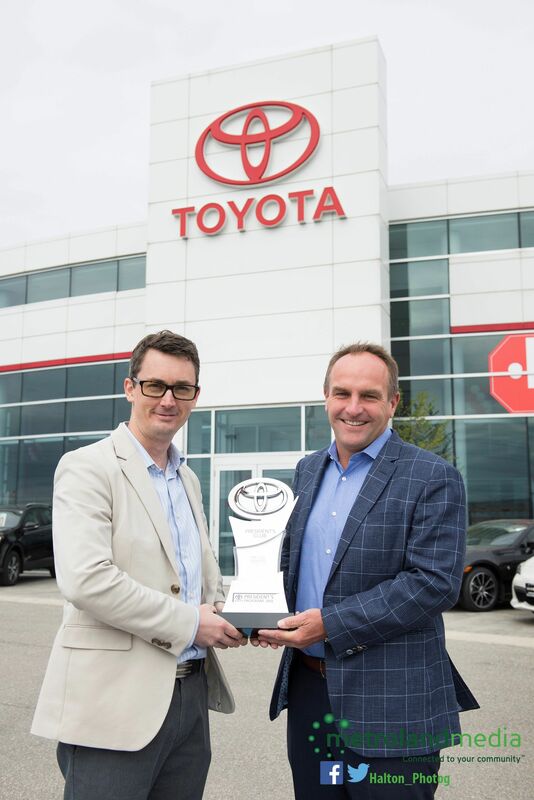 It is with great pleasure I announce Milton Toyota has once again been awarded the distinction of President’s Award for our collective efforts in 2018. This represents our 5th award in 6 years and rewards and recognizes a total team effort of delivering exceptional results across a number of key metrics – the most important being delivering an exceptional guest experience at every point of contact. The guest experience is reflected in our Toyota Sales and Service Experience survey results, together with our Google and online reviews. I am extremely proud of our team for making this prestigious award possible. There is no better proof statement for our customers and potential customers than a President’s Award. Only 34 dealers across Canada receive this award. It is indeed an exclusive club. To build the loyalty of our customers through the delivery of a positively unique and memorable sales and service experience. Milton Toyota officially opened in April 2001, but its roots started many years before. In 1960, Jim Gorman, founded Gorrud's Auto Group. What started as a "hobby" business grew steadily to become one of the most respected dealerships in Southern Ontario. Integrity, trust and quality were the building blocks for this successful company. Jim Gorman was always looking towards the future, looking to compliment Gorrud's used vehicle strength with a new vehicle dealership. While many franchises were considered, none matched Gorrud's ideals better than Toyota. Today, Gorrud's, Milton Toyota and Milton Hyundai offer customers the benefits of a full-service automotive group, one that can successfully meet almost every automotive need. In January 2009, Milton Toyota moved to its new state-of-the-art dealership at the corner of James Snow Parkway and Steeles Avenue beside our newly opened Milton Hyundai store. We look forward to the next chapter.